Here is a collection of photos from our album that we hope you enjoy, we will be adding more photos over the next few months. To enlarge the photo click on it, this will create a pop up window. Breed Stand Sydney Royal with Jim Grundig. Harmony and Willow at North of The Harbour 2009. Cara and puppies from the Olly x Kiki litter. 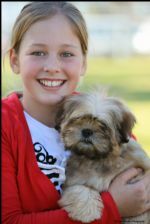 Cara and "Charlie" December 2010. Leigh and Eddy, Canberra Royal. 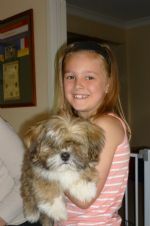 Charlie was not bred by us but is my husbands best friend and the smartest Lhasa I know. Molly, our Grand Dam and her litter of 7 parti colour puppies. A baby Georga just a little too big for the scales!